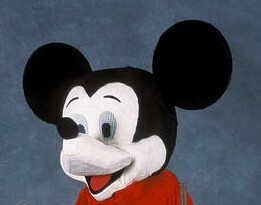 One of the challenging parts of these character is that they do not really exist in 3-D. Mickey is sometimes costumed in this way at the theme park, but the outfit is altered from that of the film. Yensid, the sorceror, is not portrayed in live action at all. We already knew from a backstage tour at Walt Disney World that I am the exact same height as the Disney character when portrayed in the parks. The hair was laid out and a ribbon of transparent organza was glued down very slightly off center the entire length of the weft. When this dried, the ribbon was glued to the mask so that the hair was not only behind the ribbon, but also draped over the top to hide it. 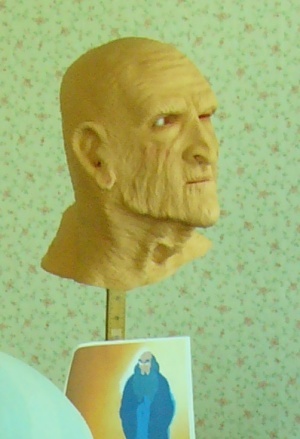 The eyebrows were added as small sections of hair and then trimmed to shape. 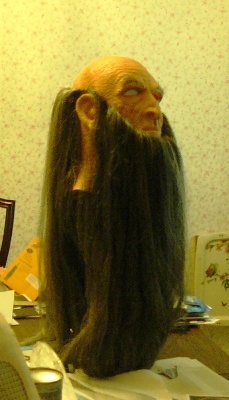 The ribbon for the hair and that for the beard meet and overlap behind the top of the ear. 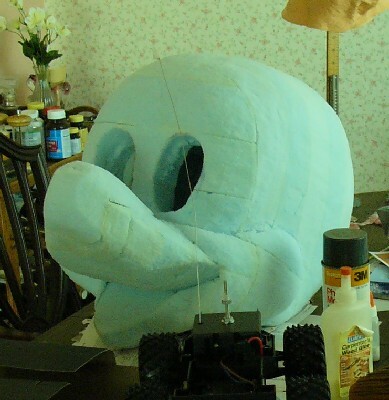 Mickey's head was carved from packing foam that was discarded by a computer company. 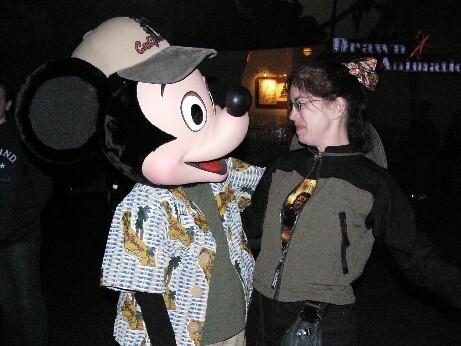 This photo of me and Mickey was the starting point. Then my head was superimposed over Mickey's. That allowed us to use the measure of my head to develop the size for Mickey and we were able to know just how much space must be left inside so that I could put on the head and see through the eyes. Once the block was built up large enough, the empty center space received a final hollowing out and the features were carved. Mickey's lower jaw and black nose were done separately and attached later. Mickey was covered with flesh colored felt attached with 3M 77 spray adhesive. His nose and inner mouth is covered in black felt, his ears and head in a lightly furred fabric and his toungue is made of craft foam. Mickey's ears are held on with long pieces of threaded brass extending into the ears and bolted with wing nuts inside the head.